﻿ What is the market demand for the Data Center Optical transceiver? High-speed optical transceiver market began to grow at the end of 2016, its core driving force is the international large/ultra large data center upgrades and new demands on 40G and 100G transceiver. As the core device to achieve photoelectric conversion, the Optical transceiver module is widely used in the data center. 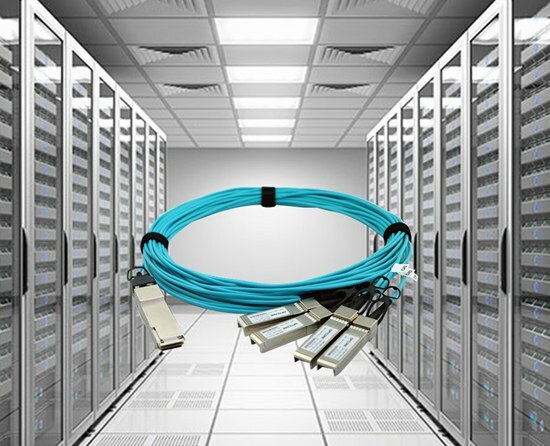 In the scene of 10G above rate and 10 meters above transmission distance, the use of optical transceiver (or active optical cable-AOC that is packaged with multimode fiber and VCSEL optical transceiver module) is the only mature cabling scheme. High-definition video, live, VR and other new applications to promote global network traffic growth, cloud computing, IaaS services, large data and other emerging application requirements for data center internal data transmission higher requirements. Therefore, the data center needs not only continuously expands, new deployment, but also needs to evolve continuously in the network architecture to achieve the Non-blocking network performance. In the process of data Center architecture evolution, the demand for the Optical transceiver has undergone new changes. Through the analysis of the traditional three-layer architecture, the improved three-layer architecture and the new two-layer architecture, it can be seen that the number of optical transceivers that the single cabinet needs to configure has increased significantly with the continuous evolution of the network architecture. The number of optical transceivers in the emerging two-tier architecture is about 44 or 48 times the number of cabinets (80-90% of which are 10G optical transceivers, 8 unit 40G transceivers or 4 unit 100G transceivers); let us highlight the high-speed optical transceiver demand, the international market due to cloud computing and other downstream applications of high-speed development, third-party data centers and cloud computing manufacturers self-built data center rapid development, network architecture to the continuous evolution of flat, high-speed optical transceiver module produce strong demand. In contrast, the Chinese market due to the downstream application is still in the early stages of development, network traffic pressure and data center data transmission within the lower demand, China’s high-speed optical transceiver market data still need to wait for the downstream application of manure. The flattening of data center mainly solves the data flow in the data center, and the data is mainly driven by cloud computing, cloud Migration, IaaS virtual configuration, distributed computing and large data (data volume, storage, and different servers). The international market AWS, Google, such as cloud platforms, Salesforce, and other professional platforms, as well as distributed computing and large-data applications of high-speed development to promote the flattening of the data center, high-speed optical transceiver module generated strong demand. In contrast, the downstream application of China is still in the stage of market cultivation and business model exploration and the market of China High-Speed Digital transceiver is expected to enter the growth period after the downstream application enters the mature stage.